Over 500 peer-reviewed studies show that molecular hydrogen – or H2 – has a therapeutic beneﬁt in every organ of the human body. Hydrogen positively affects over 150 health conditions / disease models. Free radicals cause cell damage by oxidation. Antioxidants prevent or slow oxidative stress. The H2 in Hydrogen Cup selectively targets the most damaging oxygen radicals. Adenosine Triphosphate (ATP) is the source of your energy that powers your cells. Research shows H2 increases ATP giving you more energy and also helps decrease lactic acid levels. H2 water improves performance and recovery. Hydroxyl radicals are toxic to your cells, causing pain and inﬂammation. The H2 in Hydrogen Cup neutralizes them, easing your aches and pain. When H2 neutralizes damaging oxygen radicals, it creates water (H2O) – increasing your cellular hydration. Great tasting H2 Water is easy to drink. The HydrGo+ Bottle is a portable hydrogen generating bottle that will produce molecular hydrogen in your tap or bottled water. Drink it all day for better health and to prevent illness!. Cancer patients receiving radiotherapy often experience fatigue and impaired quality of life (QOL). Many side effects of radiotherapy are believed to be associated with increased oxidative stress and inflammation due to the generation of reactive oxygen species during radiotherapy. Hydrogen can be administered as a therapeutic medical gas, has antioxidant properties, and reduces inflammation in tissues. This study examined whether hydrogen treatment, in the form of hydrogen-supplemented water, improved QOL in patients receiving radiotherapy. A randomized, placebo-controlled study was performed to evaluate the effects of drinking hydrogen-rich water on 49 patients receiving radiotherapy for malignant liver tumors. Hydrogen-rich water was produced by placing a metallic magnesium stick into drinking water (final hydrogen concentration; 0.55~0.65 mM). The Korean version of the European Organization for Research and Treatment of Cancer’s QLQ-C30 instrument was used to evaluate global health status and QOL. The concentration of derivatives of reactive oxidative metabolites and biological antioxidant power in the peripheral blood were assessed. The consumption of hydrogen-rich water for 6 weeks reduced reactive oxygen metabolites in the blood and maintained blood oxidation potential. QOL scores during radiotherapy were significantly improved in patients treated with hydrogen-rich water compared to patients receiving placebo water. There was no difference in tumor response to radiotherapy between the two groups. Daily consumption of hydrogen-rich water is a potentially novel, therapeutic strategy for improving QOL after radiation exposure. Consumption of hydrogen-rich water reduces the biological reaction to radiation-induced oxidative stress without compromising anti-tumor effects. Radiotherapy is one of the major treatment options for malignant neoplasms. Nearly half of all newly diagnosed cancer patients will receive radiotherapy at some point during treatment and up to 25% may receive radiotherapy a second time . While radiotherapy destroys malignant cells, it adversely affects the surrounding normal cells . Acute radiation-associated side effects include fatigue, nausea, diarrhea, dry mouth, loss of appetite, hair loss, sore skin, and depression. Radiation increases the long-term risk of cancer, central nervous system disorders, cardiovascular disease, and cataracts. The likelihood of radiation-induced complications is related to the volume of the irradiated organ, the radiation dose delivered, the fractionation of the delivered dose, the delivery of radiation modifiers, and individual radiosensitivity . Most radiation-induced symptoms are believed to be associated with increased oxidative stress and inflammation, due to the generation of reactive oxygen species (ROS) during radiotherapy, and may significantly affect the patient’s quality of life (QOL) . Hydrogen, a therapeutic medical gas, has antioxidant properties and reduces inflammatory events in tissues [4, 5, 6]. Drinking liquids supplemented with hydrogen represents a novel method of hydrogen gas delivery that is easily translatable into clinical practice, with beneficial effects for several medical conditions, including atherosclerosis, type 2 diabetes, metabolic syndrome, and cognitive impairment during aging and in Parkinson’s disease [7, 8, 9, 10, 11]. Currently, there is no definitive therapy to improve the QOL of patients receiving radiotherapy. Drinking solubilized hydrogen on a daily basis may be beneficial and would be quite easy to administer without complicating or changing a patient’s lifestyle. We hypothesized that oral intake of hydrogen-rich water, generated via a magnesium stick, would reduce adverse events in patients receiving radiotherapy. The study was a two-arm, randomized, controlled clinical trial. Patients were randomly assigned to receive either hydrogen-rich water or placebo water on the first day of radiation treatment, and received follow-up questionnaires on compliance and potential adverse effects. Eligible patients were informed of the study during scheduling of pre-radiation testing. Patient characteristics, including tumor origin and the specifics of radiotherapy, are listed in Table 1. Forty-nine subjects (33 men and 16 women) were enrolled between April and October 2006. The age of the patients ranged from 21 to 82 years (mean age 58.6 years). All patients were diagnosed either histologically or pathologically with hepatocellular carcinoma (HCC) or metastatic hepatic tumors. All participants received 5040-6500 cGy of radiotherapy for 7-8 weeks using a 6 MV system (Cyber Knife, Fanuc, Yamanashi, Japan). The planned target volume of the initial field was assessed by a localization/simulation procedure or by computed tomography (CT)-assisted planning and encompassed the primary tumors and a 2 cm margin. Blocks were used to shield normal tissue. Hydrogen-rich water was produced by placing a metallic magnesium stick (Doctor SUISOSUI®, Friendear, Tokyo, Japan) into drinking water (Mg + 2H2O → Mg (OH)2+ H2; final hydrogen concentration: 0.55~0.65 mM). The magnesium stick contained 99.9% pure metallic magnesium and natural stones in a polypropylene and ceramic container. The subjects were randomly assigned to groups to either drink hydrogen-rich water for 6 weeks (n = 25) or drink water containing a placebo (a casing-only stick placed in drinking water) (n = 24). Subjects were provided with four 500 mL bottles of drinking water per day and instructed to place two magnesium sticks in each bottle of water at the end of each day in preparation for consumption the following day. Participants were asked to drink 200-300 mL from one bottle each morning, and 100-200 mL every a few hours from the remaining three bottles. Subjects were instructed to reuse the magnesium sticks by transferring the sticks to a new bottle of water after use. The subjects were expected to consume 100-300 mL of hydrogen-rich water more than 10 times per day for a total minimum consumption of 1500 mL (1.5 L) and a maximum consumption of 2000 mL (2.0 L). Oral intake of hydrogen water or placebo water started on the first day of radiotherapy and continued for 6 weeks. All the patients survived through the 6 week follow-up period when the QOL questionnaire was administered. This study was conducted in accordance with Good Clinical Practice guidelines and the ethical principles of the Declaration of Helsinki (2000). The study protocol and materials were approved by the Institutional Review Board of Catholic University Medical College, and all subjects provided written informed consent prior to participation. The Korean version of the European Organization for Research and Treatment of Cancer’s QLQ-C30 instrument with modifications was used to evaluate global health status and create QOL scales . The descriptive, mailed survey developed by our institute was used in this study. The questionnaire contains five functional scales (physical, cognitive, emotional, social, and role-functioning), three symptom scales (pain, fatigue, and nausea/vomiting), and six single items to assess additional symptoms (dyspnea, insomnia, loss of appetite, constipation, diarrhea). For all items, a response scale ranging from 0-5 was used. A higher score reflected a higher level of symptoms and decreased QOL. Assessments were performed before radiotherapy and every week for 6 weeks after the initiation of radiotherapy. The concentrations of derivatives of reactive oxidative metabolites (dROMs) and biological antioxidant power (BAP) in the peripheral blood were assessed using a free Radical Analytical System (FRAS4; H&D, Parma, Italy) on the first day of radiation therapy (week 0) and after 6 weeks of radiotherapy. Blood samples were obtained from all patients after overnight fasting. FRAS4 dROMs kits were used to measure total hydroperoxide levels, which are representative of the total dROMs produced as a result of peroxidation chain reactions of proteins, lipids, and amino acids. Results were expressed in U.CARR; 1 U.CARR is equivalent to 0.08 mg/dl of hydrogen peroxide and the value is directly proportional to the concentration, according to Lambert-Beer’s law. Redox potential, including glutathione peroxidase and superoxide dismutase, were determined using the FRAS4 BAP test . Described briefly, the samples to be tested were dissolved in a colored solution containing a source of ferric ions and a chromogenic substance (a sulfur-derived compound). After a 5-minute incubation period, the degree of discoloration and intensity of the change were directly proportional to the ability of the plasma to reduce ferric ions. The amount of reduced ferric ions was calculated using a photometer to assess the intensity of discoloration; BAP results were expressed as µmol/l of reduced Fe/l. Blood chemistry tests for aspartate aminotransferase, alanine aminotransferase, gamma-glutamyl transpeptidase (γ-GTP), and total cholesterol, as well as blood hematology tests for red blood cell count, white blood cell count, and platelet count were conducted at week 0 and week 6 using standard assays in an accredited hospital laboratory. Patients underwent dynamic CT scans 1-2 months after completion of radiation treatment and tumor response was checked at 2-3 month intervals thereafter. Treatment response and local recurrence were evaluated using follow-up dynamic CT scans and serum tests for alpha-fetoprotein (AFP) and prothrombin, which is induced by vitamin K absence or antagonist-II (PIVKA-II). Tumor response was determined by the criteria established by Kwon et al. . Described briefly, complete response (CR) was defined as the disappearance of any intratumoral arterial enhancement in all target lesions. Partial response (PR) was defined as at least a 30% decrease in the sum of the diameters of viable target lesions. Progressive disease (PD) was defined as an at least 20% increase in the sum of the diameters of viable target lesions or the appearance of a new lesion. Stable disease (SD) was defined as a tumor status that did not meet any of the above criteria. Unpaired t tests were used to compare numerical data and the Yates 2 x 2 chi-square test or Fisher exact probability test was used to compare categorical data. Statistical analyses were performed using SAS 6.13 software (SAS Institute Inc., Cary, NC). The sample size of 49 patients was sufficient to detect a change in mean scores of RORTC QLQ-C30. The QOL of the patients who were given placebo water deteriorated significantly within the first month of radiotherapy (Figure 1A). There were no differences between the groups in the QOL subscales for fatigue, depression, or sleep. Gastrointestinal (GI) symptoms are one of the most common complaints of patients undergoing radiotherapy and are considered to have a high impact on the patient’s QOL after 6 weeks of radiotherapy. The patients consuming hydrogen water experienced significantly less appetite loss and fewer tasting disorders compared to the patients consuming placebo water. No significant difference was seen in the mean scores for vomiting or diarrhea (Figure 1B). Placebo water and hydrogen water improved the QOL of patients receiving radiotherapy. A. Weekly assessment of the patients’ QOL. B. Scoring system of GI symptoms after 6 weeks of radiotherapy with or without hydrogen water. Before treatment, there were no differences in total hydroperoxide levels, representative of total dROM levels, between the treatment groups. Radiotherapy markedly increased total hydroperoxide levels in the patients consuming placebo water. However, drinking hydrogen water prevented this increase in total serum hydroperoxide, as determined by the dROM test (Figure 2A), indicating decreased oxidative stress during radiotherapy in the patients who consumed hydrogen water. Similarly, endogenous serum antioxidant activity significantly deteriorated during radiotherapy in the patients consuming placebo water, and biologic antioxidant activity was maintained in patients who consumed hydrogen-rich water, even after 6 weeks of radiotherapy (Figure 2B). 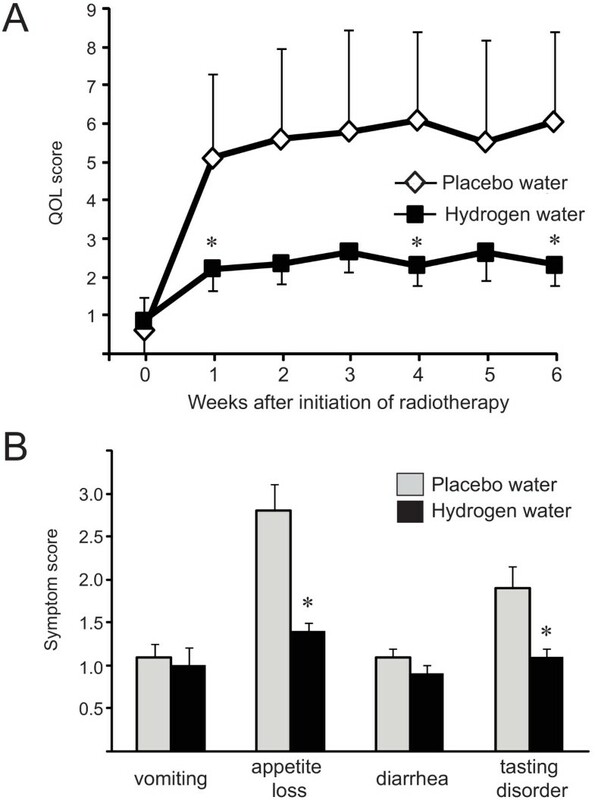 Hydrogen water mitigated oxidative stress marker during radiotherapy. Antioxidative effects in patients with placebo water (n = 24) and hydrogen rich water (n = 25). The dROM level (A) represents the total level of peroxide metabolities, and BAP (B) reflects serum antioxidant capacity. Tumor response to radiotherapy was similar between the treatment groups, and 12 of 24 (50.0%) patients in the placebo group and 12 of 25 (48%) patients in hydrogen water group exhibited either a completed response (CR) or a partial response (PR). There were no patients in either group with progressive disease (PD) during the follow-up period (3 months). Thus, drinking hydrogen water did not compromise the anti-tumor effects of radiotherapy. There were no significant differences in aspartate aminotransferase, alanine aminotransferase, gamma-glutamyl transpeptidase (γ-GTP) and total cholesterol levels at week 0 and week 6, regardless of the type of water consumed (Table 2), indicating that hydrogen water consumption did not alter liver function. Similarly, there were no significant differences in red blood cell count, white blood cell count, or platelet count between patients consuming hydrogen water and patients consuming placebo water (Table 3). To our knowledge, this is the first report demonstrating the benefits of drinking hydrogen water in patients receiving radiation therapy for malignant tumors. This finding may provide the foundation for a clinically applicable, effective, and safe strategy for the delivery of hydrogen gas to mitigate radiation-induced cellular injury. Patients experience GI symptoms and decreased QOL during radiotherapy. These symptoms usually occur as a result of the body repairing damage to healthy cells, are particularly common towards the end of a course of radiation treatment, and can last for some time. The symptoms and their impact on QOL can be worsened by having to travel to the hospital each day. Drinking hydrogen-rich water improved the QOL of the patients receiving radiotherapy and did not require additional hospital visits. Although overall survival of patients with malignant tumors should remain oncologists’ primary concern, survival should also be interpreted in light of symptom palliation and overall QOL, because the side effects of radiotherapy may negate the putative benefit of improved survival. Oral intake of daily hydrogen-supplemented water might be a prophylactic strategy to improve QOL of the patients receiving radiotherapy. 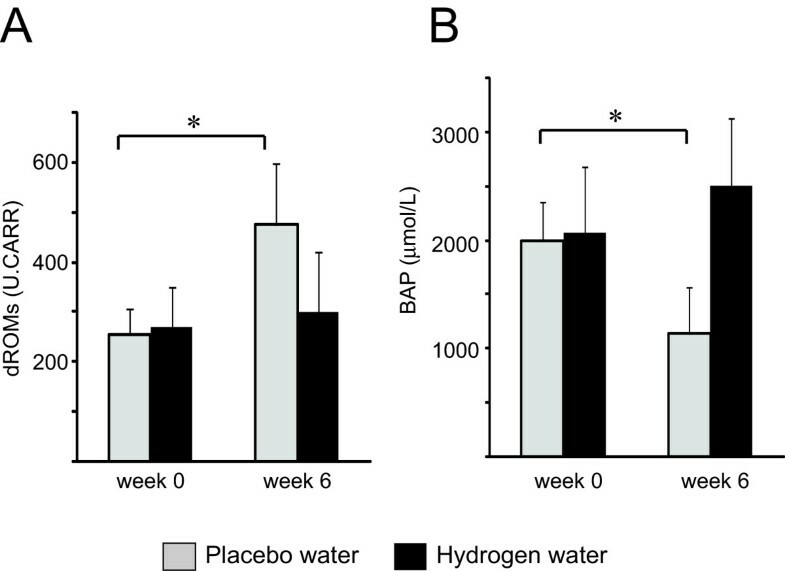 Although the mechanisms underlying the beneficial effects of hydrogen-rich water during radiotherapy have not been clearly elucidated, drinking hydrogen-supplemented water reduced dROM levels and maintained BAP levels in the serum, suggesting hydrogen-rich water exhibits potent systemic antioxidant activity. Previous experimental studies have linked daily consumption of hydrogen-rich water with improvement of a number of conditions in rodent models, including reducing atherosclerosis in apolipoprotein E knockout mice , alleviating cisplatin-induced nephrotoxicity , reducing vitamin C deficiency-induced brain injury , preventing chronic allograft nephropathy after renal transplantation , and ameliorating cognitive defects in senescence-accelerated mice  and a Parkinson’s disease model . In human studies, consumption of hydrogen-rich water prevented adult-onset diabetes and insulin resistance , as well as oxidative stress in potential metabolic syndrome . Radiotherapy is associated with an increase in ROS, followed by damage to DNA, lipids, and proteins, and activation of transcription factors and signal transduction pathways. It has been estimated that 60-70% of the ionizing radiation-induced cellular damage is caused by hydroxyl radicals . Therefore, a number of trials with the goal of reducing adverse effects due to excess ROS production have been performed with antioxidants delivered during the course of radiotherapy. Supplementation with α-tocopherol improves the salivary flow rate and maintains salivary parameters . Treatment with the antioxidant enzyme superoxide dismutase prevented radiotherapy-induced cystitis and rectitis in bladder cancer patients receiving radiotherapy . In addition, the combined use of pentoxifylline and vitamin E reduced radiation-induced lung fibrosis in patients with lung cancer receiving radiotherapy . Thus, in general, supplementation with antioxidants is likely to offer overall benefits in the treatment of adverse effects of radiotherapy. However, not all antioxidants can afford radioprotection [22, 23, 24]. Furthermore, of significant concern is the finding that high doses of antioxidants administered as adjuvant therapy might compromise the efficacy of radiation treatment and increase of the risk of local recurrence of cancer [25, 26]. Hence, the relatively lower toxicity associated with the use of these antioxidant agents is appealing, but not at the cost of poor tumor control. In contrast, in this study, drinking hydrogen-rich water did not affect radiotherapy’s anti-tumor effects. Our results may suggest that hydrogen water functions not only as an antioxidant, but also plays a protective role by inducing radioprotective hormones or enzymes. Although further studies are warranted to elucidate the safety of hydrogen-rich water and determine the optimal concentration of hydrogen in drinking water, as well as involved mechanisms, daily intake of hydrogen-rich water may be a promising approach for counteracting radiation-induced impairments to QOL. This therapeutic use of hydrogen is also supported by the work of Qian et al., who demonstrated that treating human lymphocyte AHH-1 cells with hydrogen before irradiation significantly inhibited ionizing irradiation-induced apoptosis and increased cell viability in vitro. They also showed that injection of hydrogen-rich saline could protect the gastrointestinal endothelia from radiation-induced injury, decrease plasma malondialdehyde and intestinal 8-hydroxydeoxyguanosine levels, and increase plasma endogenous antioxidants in vivo . In conclusion, our study demonstrated that drinking hydrogen-rich water improved QOL and reduced oxidative markers in patients receiving radiotherapy for liver tumors. This novel approach of oral intake of hydrogen-rich water may be applicable to a wide range of radiation-related adverse symptoms. Hydrogen, the simplest gas in nature, was recently reported as a therapeutic antioxidant through selectively reducing cytotoxic oxygen radicals. Though hundreds of studies on curative effects of hydrogen were published and justified, the mechanism remains unclear. We proposed several promising directions in this area by relatively in-depth analysis. Firstly, the physiological function of hydrogen was regarded neutralizing free radicals at a low dose; however, physiological effects of an excessive dose of hydrogen were necessary for the comprehensive understanding. Secondly, the therapeutic effects and mechanisms were explained by anti-oxidative, anti-inflammatory and apoptosis ways, while the limitation was obvious and needed update. Thirdly, further studies might be focused on the possible networks including effecters and receptors of hydrogen, and the evolutionary perspective was a good point of view. In conclusion, this review might be a reference and guidance for relative scholars. Hydrogen(H2) is the simplest and widely distributed element in nature, and the most abundant ingredient of human body composition. Hydrogen gas is colorless, odorless and tasteless, and was believed physiologically inert in the body before. However, in 2007 Oshawa et al. from Japan reported that hydrogen could ameliorate cerebral ischemia-reperfusion injury and selectively reduce cytotoxic oxygen radicals including hydroxyl radical (•OH) and peroxynitrite (ONOO−) on Nature Medicine , which provoked a worldwide intensive attention and overturned our previous cognition. It was then hypothesized that hydrogen might be not only a resource for clean energy but also a promising therapeutic medicine. Till now, more than 400 papers and reviews have already been published in this field on dozens of diseases, involving various types of organ and tissue ischemia, atherosclerosis, senile dementia, neural degenerative diseases and so on -. However, a few problems were encountered for further investigations. Firstly, the probable signal transduction pathways were indecisive. It was still wondered whether hydrogen acted with free radicals directly or initiated the effectors to ameliorate the injuries. Secondly, the experiments before were mainly practiced on animals, while clinical verification and randomized controlled double-blinded researches on human beings were still uncertain. Therefore, it was high time that we make breakthroughs to give the biological study on hydrogen an extra boost. Since the underlying mechanisms were very important to help deepen the understanding, guide the future study, confirm more candidate disease models and extend the application, and as the study group having published the most related essays, we raised some promising research models and directions as a reference for scholars in this field. Oxidative injuries occur with a significant increase of various kinds of reactive oxygen species(ROS) , including hydrogen dioxide (H2O2), superoxide anion (O2−), ·OH, nitric oxide (NO•), and ONOO−. The ROS breaks the homeostasis of the oxidative and anti-oxidative arrangement and irretrievably drives downstream signaling networks, leading to peroxidation of nucleic acids or fatty acids, removal of protein cross-linking, and apoptosis of cells finally. H2 is non-inflammable nor non-explosive when its concentration is below 4.1% in pure oxygen or 4.6% in air . In 2007 Ohsawa et al. showed that H2 was a unique free radical scavenger, which selectively reduced •OH and ONOO−, maintaining the physiological homeostasis in cells such as reducing destruction of various anti-oxidases and deoxyribonucleic acid(DNA) and ensuring the normal function of signalization. Animal studies showed that inhalation of 2% hydrogen or intraperitoneal injection of saturated hydrogen saline could selectively scavenge ROS, inhibit inflammation and reduce oxidative damage ,. However, in-vitro evidences of selective anti-oxidative effects still required direct conviction and sufficiency, for the most unequivocal evidence before was acquired in solution without repeated experiments -. Meanwhile, the in-vivo studies at present, which observed the changes of effects or molecules, were also the downstream action of ROS . On the other hand, it is also important to identify the physiologically side effects of hydrogen, in view of the fact that we should consider a widely accepted biological law, which is as long as the dose exceeds a certain limitation, it reverses its course. It seems unreasonable that hydrogen treats diseases without any physiological side effects. Meanwhile, the studies on the side effects would help us to understand the biological function of hydrogen more comprehensive. Hydrogen was supposed to ameliorate dozens of diseases. Except the property of selectively reducing oxygen radicals, its effects of anti-inflammation ,, and anti-apoptosis , were also regarded importantly. Oxidative stress is relevant to inflammation and apoptosis due to free radicals would impair cells and produce many inflammatory factors, which acts as an important starting aspect in cell death. The downstream cascade reaction of the therapeutic effects might reveal the deep protective mechanisms and net works of hydrogen. For anti-oxidative ways, anti-oxidases were considered participating positively. Apart from neutralization with free radicals directly, it was reported that hydrogen increased the expression of anti-oxidases both in in-vivo  and in-vitro . Nuclear factor – erythroid 2-related factor 2(Nrf2), the key transcription factor like the commander-in-chief in endogenous anti-oxidative system, was validated a hot spot and an important effecter . Once the Nrf2 is activated after the administration of hydrogen, it initiates the endogenous anti-oxidative system, including expressions of uperoxide dismutase(SOD)  and glutathione(GSH) . For example, heme oxygenase-1(HO-1), as one of critical downstream molecule of Nrf2, was found to regulate oxidative stress in a range of diseases, such as neurodegenerative disease  and in LPS-stimulated RAW 264.7 macrophages . On the other hand, the endogenous anti-oxidative system was different from the exogenous anti-oxidative drugs or exogenous hydrogen. Generally, exogenous drugs cannot activate endogenous anti-oxidase, for the reason that in a feedback manner, exogenous anti-oxidants might ameliorating ROS while inhibit endogenous anti-oxidative system since ROS are significant major factors in activating endogenous anti-oxidative system. So, it should be determined whether ROS or the endogenous anti-oxidative hydrogen weights more in the protective role. Based on the discussion above, it might be hypothesized that hydrogen mobilizes the endogenous anti-oxidative system through activating Nrf2 expression besides playing the direct anti-oxidative role with ROS. For anti-inflammatory effects, hydrogen was proved suppressing various inflammatory cytokines. Du Z et al. showed that hydrogen-rich saline could reduce the level of interleukin(IL)-6, tumor necrosis factor-α(TNF-α) and malondialdehyde(MDA) in plasma. Yoon et al. reported that the levels of Th2 cytokine, IL-5, and proinflammatory cytokines such as TNF-α and IL-6 in Hydrogen-fed mice were significantly lower than in control and Purified Water-fed mice. Buchholz et al. reported that H2 can downregulate the expressions of pro-inflammatory cytokines such as TNF-α, IL-6, IL-1β, chemokine(C-C motif) ligand 2(CCL2). Liu et al. proved that the pro-inflammatory cytokines (TNF-α, IL-1β and high mobility group box-1 protein (HMGB1)), anti-inflammatory cytokine (IL-10) were regulated by hydrogen. However, the networks of the effects are still unclear, and to find the receptors or effecters is the task in the future. Effects of apoptosis are less predominant since the result of cell death is concentrated from various extremely harmful factors. It was hypothesized that accumulation of ROS is one of the several means to cause the apoptotic process, since the increasing of ROS releases arachidonic acids and provokes lipid peroxidation, causing damages to cells. Standing on this point of view, H2 can suspend neuronal apoptosis by neutralizing ROS, which has been investigated in many studies. Cai et al. demonstrated that H2 presented the ability of neuroprotection by reducing HI-induced caspase-dependent apoptosis in in vivo. And in the following study, they found that the lipid peroxidation level was reduced, and neural apoptosis was thus decreased due to H2 administration . The therapeutic effects of hydrogen were observed and verified. However, the molecule mechanism was uncertain and challengeable. It is important to discuss how to design and perform the specific experiments in the future. We define the direct effects of hydrogen by neutralizing ROS and the indirect effects by activating possible proteins. Further studies on indirect effects should take the priority. Firstly, the existence of hydrogen is transient in the body. Hydrogen would be exhaled and removed in about 30 min as long as the administration is stopped . Many results showed that a short time exposure of hydrogen had durative and long term effects ,. The long term therapeutic effects could not be explained with such a short time of administration, so it indicated that hydrogen possessed indirect effects instead of reducing ROS. To prove this, preconditioning studies are recommended. Preconditioning studies were mostly used in observing indirect effects of one particular factor. In this experiment, animals and cells should be first preconditioned by hydrogen for several days and then received the injury operation. Once the protective effects of preconditioning hydrogen are proved, it can be identified that hydrogen has indirect effects rather than directly decreasing ROS. The study might overthrow the selectively anti-oxidative theory and raise multiple mechanisms more than only neutralizing toxic ROS. Secondly, it was also unidentified physiologically whether hydrogen can activate molecules such as Nrf2, ghrelin, FGF21, HO-1 and so on in healthy animals and human. If physiologically not, it might indicate that the molecules are induced by oxidative stress rather than effecters of hydrogen. To confirm this, using specific blockers and gene knocking-out techniques are ideal methods: reduced effects will prove that hydrogen physiologically activate these molecules. Thirdly, effecter factors that hydrogen activates should be investigated, which is more difficult. Methods of omics might be used to seek interesting molecule. Luckily, various oxido-reductase have been found participating in the effects of hydrogen. Furthermore, to investigate the mechanism of hydrogen, evolutionary perspective is a creative and good point. First, most of the bacteria and lower animals and plants can produce and utilize hydrogen, so it is feasible that hydrogen might be biologically active in human. Second, bacterial enzymes producing hydrogen are the current highlight in the hydrogen energy field, and molecule details in the hydrogen producing are very clear ,. Last but not the least, during the evolutionary process, these molecules or enzymes might have residual sites for hydrogen. It is leading to the guess that hydrogen is a substance for physiological accommodation as a novel antioxidant gas with medical applications, following NO, CO, and H2S. The physiological function of a small amount of hydrogen was regarded neutralizing free radicals; however, an excessive dose of hydrogen might be investigated for comprehensive physiological effects. To explain for the therapeutic effects and mechanisms, antioxidant, anti-inflammatory and apoptosis ways were introduced while the limitation was obvious and needed update. In addition, further studies might be focused on the possible networks including effecters and receptors of hydrogen, and the evolutionary perspective is a good point of view. In short, the hydrogen therapy might be an alternative in the clinic. The field of hydrogen biology has a clear objective, a bright future and arduous tasks and our hard work in this area is a decisive contribution for human health. Allogeneic haematopoietic stem cell transplantation (HSCT) has been widely used for the treatment of haematological malignant and non‐malignant haematologic diseases. However, acute graft‐versus‐host disease (aGVHD) is a kind of severe complication of HSCT limiting its application. Cytokines such as tumour necrosis factor‐α (TNF‐α), IL‐6 play an extremely important role in the formation and development of aGVHD. Besides, the oxidation phenomena and/or the formation of free radicals have been suggested to be causally related to various haematological disorders including aGVHD. Reactive oxygen species (ROS), such as hydroxyl radicals, play an important role in the formation and development of aGVHD. Hydrogen has been reported to have the ability to inhibit levels of cytokines such as TNF, IL‐6 in vivo. Our recent studies provided evidence that hydrogen inhalation can selectively reduce cytotoxic oxygen radicals and exert antioxidant effects. Therefore, we suggested that hydrogen may have therapeutic effects on aGVHD. This hypothesis entails many experimentally testable predictions. We propose the experimental study by detecting complete blood counts (CBC) and Clinic signs of aGVHD mice. We also propose to detect the levels of TNF‐α, IL‐2, IL‐1β, IL‐6 which play important roles in the pathogenesis of aGVHD. To discover potential mechanisms of the therapeutic effects of hydrogen on the aGVHD model, we will examine gene‐expression profiles. This study will open a new therapeutic avenue combining the field of therapeutic medical gases and aGVHD. This theory is original and probably of importance, because therapeutic medical gases have never been used for aGVHD previously. Hydrogen is the most abundant chemical element. Hydrogen gas has been extensively used in chemical field such as fuel processing, fertilizer production (3H2 + N2 → 2NH3) and so on. It is a colourless, odourless, non‐metallic, tasteless, highly flammable diatomic gas which was considered as a physiological inert gas. Early in 1975, Dole et al. 1found that inhalation of a mixture (2.5% O2 and 97.5% H2) at a total of 0.8 MPa for 2 weeks caused a marked regression of the skin squamous cell carcinoma in a mouse model, and they tried to elucidate the phenomenon with the possibility of H2 as a free radical decay catalyser. In 1988, A paper by Buxton et al. 2 demonstrated that H2 could reduce hydroxyl radicals (·OH) produced by radiolysis or photolysis of H2O in cell‐free systems. In 2001, it was demonstrated that schistosomiasis‐associated chronic liver inflammation was significantly attenuated by one normal atmosphere supplemented with 0.7 MPa H2 in mice 3. However, these investigations did not draw attention from researchers. In 2007, Ohsawa et al. 4discovered that hydrogen gas has antioxidant and antiapoptotic properties that protect the brain against ischaemia–reperfusion injury and stroke by selectively neutralizing hydroxyl and peroxynitrite radicals. Since then, hydrogen gas has come to the forefront of therapeutic medical gas research. Recent basic and clinical research has revealed that hydrogen is an important physiological regulatory factor with antioxidant, anti‐inflammatory and antiapoptotic protective effects on cells and organs 5-10, proving that hydrogen could down‐regulate cytokines, including CCL2, IL‐1β, IL‐6, IL‐12, TNF‐α, etc. We also have proposed and proved that hydrogen has radioprotective effects in cultured cells and mice 11-17. It also has been demonstrated that H2 is effective in the prevention of cerebral, myocardial, hepatic ischaemia–reperfusion injuries and other injuries 18, 19. Since 2009, hydrogen was applied on the field of organ transplantation including intestinal transplantation, lung transplantation, renal transplantation and heart transplantation. It was demonstrated that hydrogen could protect allograft function in those models 19-23. However, the potential effect of hydrogen gas on another transplantation type is largely ignored. That type is the allogeneic haematopoietic stem cell transplantation. Allogeneic HSCT is a potentially curative therapy for many malignant haematologic disorders, while it is restricted by its severe complications. One major complication associated with HSCT is aGVHD, which is a major cause of death following allo‐HSCT. Three complex stages are involved in the pathophysiology of aGVHD 24. Stage I involves tissue damage and cellular activation induced by preconditioning. Stage II involves activation of donor lymphocytes (T cells). In Stage III, cellular and inflammatory factors are released, including TNF‐α, interleukin (IL)‐1 and IL‐6 et al. These cytotoxic molecules directly attack various host tissues and underlie the clinical manifestations of aGVHD 25, 26. The activated cells also produce a large number of harmful free radicals resulting in severe cell damage, which also play an important role in the development of aGVHD 27. Nowadays, the standard initial therapy for aGVHD includes the use of high‐dose steroids, which results in about 40% complete response (CR) rate 28. This CR rate is unsatisfactory, and in patients who have less than a CR, there is high mortality, both from the aGVHD itself and from the steroid‐related infectious complications. Treatment of steroid‐resistant aGVHD is very difficult, with many institutions using monoclonal antibody treating steroid‐resistant aGVHD patients, including anti‐TNF‐α monoclonal antibody(mAb), anti‐CD52 mAb, anti‐CDl47 mAb (ABX.CBL), anti‐CD3 mAb, et al. But their therapeutic effects are not ideal, while with high infection rate. Overall, those treatments of aGVHD did not achieve significant breakthroughs. Various researchers have engaged in identifying novel, non‐toxic, effective and convenient drugs to cure or alleviate aGVHD. Our hypothesis is that hydrogen gas may have therapeutic effects on aGVHD. Our hypothesis is based on the theory that hydrogen could down‐regulate cytokines, CCL2, IL‐1β, IL‐6, IL‐12, TNF‐α, et al. and selectively reduce hydroxyl and peroxynitrite radicals (Fig. 1). In addition, H2 has other advantages; it has demonstrated that H2 has non‐toxicity at any pressure 29. It can penetrate biomembranes and diffuse into the cytosol, mitochondria and nucleus to protect nuclear DNA and mitochondria 30. Cytotoxic oxygen radicals that hydrogen could selectively reduce. As those cytokines including IL‐6, IL‐1, TNF‐α, et al. and free radicals have been suggested to play great important roles in the formation and development of aGVHD as discussed above, we suggested that hydrogen gas may be potentially effective for aGVHD by down‐regulating cytokines and selectively reducing hydroxyl and peroxynitrite radicals. For testing the hypothesis, hydrogen gas could be administered by two ways: First, it may be administered to patients via inhalation as room air at safe concentrations (<4.6% in air by volume). Second, we can dissolve hydrogen gas into water delivering it as drinking water. This may be more practical in daily life and more suitable for daily consumption for therapeutic use. Hydrogen‐rich drinking water can be generated by several methods including dissolving electrolysed hydrogen into pure water, dissolving hydrogen into water under high pressure and utilizing electrochemical reaction of magnesium with water. We propose the experimental study by detecting CBC, Clinic signs of aGVHD mice (weight loss, posture, activity, fur change, skin integrity) as described previously 31, 32. We also propose to detect the levels of TNF‐α, IL‐2, IL‐1β, IL‐6 as described previously 33, 34, which have been demonstrated to play important roles in the pathogenesis of aGVHD. And plasma malondialdehyde (MDA), 8‐hydroxydeoxyguanosine (8‐OHdG) and endogenous antioxidants such as SOD, GSH will also be detected in vivo. To discover potential mechanisms of the therapeutic effects of hydrogen on the aGVHD model, we will examine gene‐expression profiles, such as expression of Bcl‐2, Bax, Caspase‐3, Caspase‐8 35, 36. On the basis of these experimental designs, we preliminarily demonstrated the therapeutic effects of hydrogen on aGVHD in a mice model 37. We demonstrated that hydrogen treatment could protect mice from lethal GVHD and improve clinic syndrome of aGVHD mice and also could promote the recovery of white blood cells of aGVHD mice. We also examined serum cytokine levels. Cytokines, such as TNF‐α, IL‐2 were also reduced by hydrogen, which play critical roles in the development of aGVHD (Fig. 2). Cytokines that hydrogen could down‐regulate (→) in the pathogenesis of aGVHD. Adapted from Ferrara 38. This study will open a new therapeutic avenue combining the field of therapeutic medical gases and aGVHD. This theory is original and probably of importance, because therapeutic medical gases has never been used for aGVHD previously. We believe that in vitro and in vivowork for hydrogen gas on aGVHD would come in great numbers as soon as possible. In view of the high lethality rate of aGVHD, hydrogen gas may give us more hope for greater survival with few side effects. This work was supported by a grant from the National Natural Science Foundation of China (grant no. 81072241). Ten male soccer players aged 20.9 ± 1.3 years old were subjected to exercise tests and blood sampling. Each subject was examined twice in a crossover double-blind manner; they were given either HW or placebo water (PW) for one week intervals. Subjects were requested to use a cycle ergometer at a 75 % maximal oxygen uptake (VO2) for 30 min, followed by measurement of peak torque and muscle activity throughout 100 repetitions of maximal isokinetic knee extension. Oxidative stress markers and creatine kinase in the peripheral blood were sequentially measured. Since energy demands and oxygen consumption increase during supermaximal exercise, such as intermittent running, sprints, and jumps, production of reactive oxygen species (ROS) and reactive nitrogen species (RNS) also increase, threatening to disturb redox balance and cause oxidative stress. During normal conditions, ROS and RNS are generated at a low rate and subsequently eliminated by the antioxidant systems. However, a greatly increased rate of ROS production may exceed the capacity of the cellular defense system. Consequently, substantial free radicals’ attack on cell membranes may lead to a loss of cell viability and to cell necrosis and could initiate the skeletal muscle damage and inflammation caused by exhaustive exercise [1, 2, 3]. Although well-trained athletes suffer from less oxidative stress reduction because their antioxidant systems adapt, accumulation of intense exercise can provoke an increase in oxidative stress . To mitigate oxidative stress-induced adverse events during sports, antioxidant supplementation among athletes has been well documented. Although results of these studies are often contradictory depending on the antioxidant compounds and quantity, some studies demonstrate the beneficial effects of antioxidants on muscle fatigue or performance [5, 6]. Ten male soccer players aged 20.9 ± 1.3 years old were subjected to exercise tests and blood sampling. None of the subjects were smokers or were taking any supplements/medicines. Each subject provided written informed consent before participation in accordance with the University of Tsukuba’s Human Research Ethics Committee. Physical characteristics of the subjects are shown in Table 1. All the players were involved in daily training sessions except the day of experiment. A plastic shelled product consisting of metallic magnesium (99.9 % pure) and natural stones in polypropylene containers combined with ceramics (Doctor SUISOSUI®, Friendear, Tokyo, Japan) was used to produce hydrogen. The product was capable of generating hydrogen when placed in drinking water via the following chemical reaction: Mg + 2H2O → Mg (OH)2 + H2. The magnesium stick or a placebo (a casting-only stick without magnesium) was immersed in mineral water (Volvic®, Kirin Inc., Tokyo) for 24 hours prior to drinking. The final hydrogen concentrations of the placebo water (PW) and hydrogen-rich water (HW) were 0 and 0.92 ~ 1.02 mM, respectively [9, 11]. Each subject was examined twice in a crossover double-blind manner, given either HW or PW for one week intervals. Subjects were provided with three 500 ml bottles of drinking water and instructed to place two magnesium sticks in each bottle 24 hours prior to drinking. Participants were asked to drink one bottle at 10:00 PM of the day before the test, one at 5:00 AM, and one at 6:20 AM on the day of examination. In summary, subjects consumed 1,500 ml of HW or PW. The research protocol started at 6:00 AM. Subjects were given meals between 9:00 PM and 10:00 PM the day before experiments, and fasted overnight. No breakfast was given on the day of the experiments. The subjects were first required to rest in a sitting position for 30 minutes. The exercise test consisted of the following: 1) Maximal progressive exercise test to define maximal oxygen uptake (VO2max); 2) cycling an ergometer for 30 minutes at approximately 75 % VO2max (Exercise-1); and 3) Running 100 maximal isokinetic knee extensions at 90 ° sec-1 (Exercise-2). Blood samples were collected from an antecubital vein just before Exercise-1 (6:30 AM), immediately after Exercise-1 (7:15 AM), immediately after Exercise-2 (7:30 AM), 30 minutes after Exercise-2 (8:00 AM) and 60 minutes after Exercise-2 (8:30 AM). First, to define maximal oxygen uptake (VO2max), the subjects were subjected to a maximal progressive exercise test on a bicycle ergometer (232CL, Conbiwellness, Tokyo). The test consisted of a continuous step test beginning at a 30 W load, and increasing by 20 W every minute until exhaustion. The subjects were instructed to ride at 50 rpm/min. Pulmonary gas exchange values were measured using an exhaled gas sensor (AE280S, Minato Medical®, Osaka, Japan) via a breath-by-breath system, and the mean values were calculated every 30 seconds for analysis. We determined that VO2max was reached when the oxygen consumption reached its plateau . Before the test started, the subjects rested for two minutes. After warming up at a load of 50 W for one minute, the subjects were instructed to ride at submaximal levels for 30 minutes. Pulmonary gas exchange values were monitored to maintain VO2max at approximately 75 %. During the experiments, the subjects were frequently verbally instructed to control the range of motion to maintain VO2max at approximately 75 %. Repeated analysis of variance (ANOVA) tests were used to compare pre- and post-exercise measurements. The F-test with Bonferroni post hoc group comparisons was performed where appropriate. Probability values less than 0.05 were considered to be statistically significant. SPSS 18.0 was used to perform the statistical analysis. Since the experiment was planned to have a 90 % power of achieving significance at the 5 % level, the sample size in this model is calculated to be between 8.91 and 9.25 (90 % power and 5 % significance level) in blood lactate levels based on our previous experiences. Therefore, we assumed the sample size would be appropriate for accumulation of preliminary data. As shown in Table 2, blood d-ROMs BAP and CK levels increased after exercise in subjects in both groups treated with PW and HW. However, there was no statistical difference between the groups. Eventhough the blood lactate level were significantly increased in both HW and PW at 45 and 60 min after exercise, these levels were comparably and significantly lower in the HW than in the PW group (Figure 1). Data were shown as mean ± standard deviation (SD). *p < 0.05 vs 0 min. Sequential changes of blood lactate levels during exercise. Blood lactate levels in the athletes given PW significantly increased immediately after exercise compared to the levels at pre-exercise. HW significantly reduced blood lactate levels post exercise using bicycle ergometer. (*p < 0.05 vs. time 0. #p < 0.05 vs HW, N = 10). (A) Changes in peak torque (PT) every 20 repetitions (rep = 1 frame) during 100 maximum isokinetic knee extensions. PT of the subjects treated with PW significantly decreased during the initial 40-60 contractions by approximately 20-25 % of the initial values, followed by a phase with little change. On the other hand, there was no statistical difference between Frame 1 and Frame 2 in HW, indicating that HW prevented the decreasing the peak torque during the first 2 Frames. HW, Hydrogen rich water; PW, Placebo water. (*p < 0.05 vs Frame 1, N = 10). (B) Changes in median frequency (MDF) every 20 repetitions (rep = 1 Frame) during 100 maximum isokinetic knee extensions.Although exercise significantly reduced MDF values during the first 2 Frames, there was no statistical difference between HW and PW in all Frames. HW, Hydrogen rich water; PW, Placebo water. (*p < 0.05 vs Frame 1, N = 10). (C) Changes in mean power frequency (MPF) every 20 repetitions (rep = 1 Frame) during 100 maximum isokinetic knee extensions.There was no statistical difference between HW and PW in all Frames. HW, Hydrogen rich water; PW, Placebo water. (*p < 0.05 vs Frame 1, N = 10). Factors such as age, nutritional status, training level, and physical activity category can influence the results [22, 23]. Although we had anticipated that hydrogen, a known antioxidant, would reduce oxidative stress following acute exercise, the effects of oral intake of HW were marginal and did not affect the level of oxidative markers after exercise. This can be explained by the facts that the athletes in our study have routinely trained and their antioxidant defense systems may be more active. Previous studies reported that repeated aerobic training increases antioxidant enzyme activity and subsequently decreases oxidative stress [2, 24, 25, 26]. Also, considering the short life-span of hydrogen in circulation , more frequent drinking of HW during exercise might have additional effects. In a future study, the efficacy of HW on untrained subjects or recreational exercisers, who may have poorly established antioxidant systems to combat exercise-induced oxidative stress, should be tested. Furthermore, different drinking protocols should be investigated. Metabolic syndrome is characterized by cardiometabolic risk factors that include obesity, insulin resistance, hypertension and dyslipidemia. Oxidative stress is known to play a major role in the pathogenesis of metabolic syndrome. The objective of this study was to examine the effectiveness of hydrogen rich water (1.5–2 L/day) in an open label, 8-week study on 20 subjects with potential metabolic syndrome. Hydrogen rich water was produced, by placing a metallic magnesium stick into drinking water (hydrogen concentration; 0.55–0.65 mM), by the following chemical reaction; Mg + 2H2O → Mg (OH)2 + H2. The consumption of hydrogen rich water for 8 weeks resulted in a 39% increase (p<0.05) in antioxidant enzyme superoxide dismutase (SOD) and a 43% decrease (p<0.05) in thiobarbituric acid reactive substances (TBARS) in urine. Further, subjects demonstrated an 8% increase in high density lipoprotein (HDL)-cholesterol and a 13% decrease in total cholesterol/HDL-cholesterol from baseline to week 4. There was no change in fasting glucose levels during the 8 week study. In conclusion, drinking hydrogen rich water represents a potentially novel therapeutic and preventive strategy for metabolic syndrome. The portable magnesium stick was a safe, easy and effective method of delivering hydrogen rich water for daily consumption by participants in the study. Metabolic syndrome is characterized by a constellation of metabolic and anthropometric abnormalities, which include excess weight, hyperglycemia, hypertension, low concentration of high density lipoprotein (HDL) cholesterol and hypertriglyceridemia [1–3]. Metabolic disease remains a serious concerns in the United States and people with metabolic syndrome are at increased risk of developing cardiovascular disease and type II diabetes [3, 4]. Free radicals and other reactive oxygen species (ROS) are derived either from normal essential metabolic processes in the human body or from external sources such as exposure to X-rays, ozone, cigarette smoking, air pollutants and industrial chemicals . Disturbance of the balance between production of oxygen free radicals (or some other radical species) and activity of the antioxidant system of protection causes oxidative stress . Recent evidence implicated oxidative stress in the pathogenesis of metabolic syndrome [1, 2, 7]. Oxidative stress and nutritional changes also contribute to the aging process and to many age-related diseases and may affect cardiovascular function by either involving the long-term development of atherosclerosis or causing immediate damage during a heart attack or stroke . Typically, ROS reacts with lipids causing lipid peroxidation leading to oxidative destruction of unsaturated fatty acids and damage of cell membranes with indirect damage to other cell constituents . Therefore mitigating oxidative stress may have a significant impact for people in pre-metabolic syndrome status. Hydrogen has been identified as having therapeutic antioxidant properties by selectively reducing cytotoxic ROS in tissues [10, 11]. As hydrogen is a gaseous molecule, inhaled hydrogen might be an easy delivery strategy. Although it is safe at a concentration lower than its threshold of 4.6% in air, the translational applicability of inhaled hydrogen gas is limited to medical care facilities as it is an inflammable gas and cannot be realistically and safely administered . Oral intake of liquid containing hydrogen represents a novel and easily translatable method of delivery of hydrogen gas. Previous animal studies have linked daily consumption of hydrogen rich water, generated by bubbling or direct contact with hydrogen gas, with reduced atherosclerosis in apolipoprotein E knockout mice , alleviated cisplatin-induced nephrotoxicity , improved vitamin C deficiency-induced brain injury  and prevented chronic allograft nephropathy after renal transplantation . In addition, the beneficial effects of consuming hydrogen rich water in the prevention of adult onset diabetes and insulin resistance has been reported in a human study . We hypothesized that oral intake of hydrogen rich water generated via a magnesium stick may reduce oxidative stress in human subjects with potential metabolic syndrome. As metabolic syndrome is a disease closely associated with lifestyle-related habits, oral intake of hydrogen on a daily basis via drinking water may be ideal, for people without complicating or changing their life style. The administration of hydrogen rich water via a portable magnesium stick was considered to be a safe and feasible method of delivery and was investigated in an open label study, on subjects with potential metabolic syndrome. This study was an open label pilot study conducted at a single site with an 8 week treatment period. Twenty subjects ≥40 years, males (n = 10) and females (n = 10) were enrolled from existing patient databases or by advertisement. In order to qualify, subjects were required to have one or more of the following conditions: body mass index (BMI) between 25.0 and 34.9 kg/m2, waist circumference of ≥100 cm for males and ≥88 cm for females, pre-hypertension (diastolic blood pressure of 80–89 mmHg and systolic blood pressure of 139 mmHg or lower), pre-diabetes (fasting plasma glucose from 5.2 to 6.9 mmol/L), total cholesterol >5.18 mmol/L and/or low density lipoprotein (LDL) >2.59 mmol/L. At screening, subjects provided written informed consent and, inclusion and exclusion criteria, medical history and prior use of concomitant medications were reviewed. Subjects were required to be weight stable (for 3 months prior to study) and those subjects that were smokers were encouraged not to change their smoking habits. Subjects were required to discontinue other natural health products three weeks prior to randomization and during the study and to maintain their current level of physical activity and dietary habits during the course of the study. Subjects were excluded from participating if they were pregnant, breastfeeding, or planning to become pregnant, had uncontrolled hypertension, or history of diagnosed disease or condition including diabetes (Type I or II), cardiovascular disease, cancer, renal and/or liver disease, history of psychiatric disorder or drug/alcohol abuse, used prescription or over the counter products for vasodilation, erectile dysfunction, weight loss, and/or hypercholesterolemia, use of anticoagulants or had participated in a clinical research trial within 30 days prior to randomization. This study was conducted at KGK Synergize, Inc., London ON, Canada. The study was conducted in accordance with Good Clinical Practice Guidelines and the ethical principles of the Declaration of Helsinki (2000). The study protocol and materials were approved by the Institutional Review Board Services (Aurora, Ontario), and all subjects gave written informed consent prior to participation. A plastic shelled product consisting of metallic magnesium (99.9% pure) and natural stones in the polypropylene containers combined with ceramics (Doctor SUISOSUI®, Friendear, Tokyo, Japan) was used to produce hydrogen. The product was capable of generating hydrogen when placed in drinking water by the following chemical reaction; Mg + 2H2O → Mg (OH)2 + H2 (Fig. 1). Hydrogen water sticks were dispensed at baseline and week 4 and used sticks were collected at week 4 and week 8 and compliance calculated. A. Magnesium stick and the methods to generate hydrogen water in 500 ml bottles of drinking water. A plastic shelled product consisting of metallic magnesium (99.9% pure) and natural stones in the polypropylene containers combined with ceramics (Doctor SUISOSUI®, Friendear, Tokyo, Japan) was used to produce hydrogen. The product was capable of generating hydrogen when placed in drinking water by the following chemical reaction; Mg + 2H2O → Mg (OH)2 + H2. B. Hydrogen concentrations in the water bottle (n = 3). The hydrogen concentration in a water bottle was maintained between 0.55 and 0.65 mM over an 8 week period. In a retrospective study conducted at the University of Pittsburgh, in a setting similar to the study procedures followed in the current study, the hydrogen concentration in a water bottle was sequentially monitored using a hydrogen needle sensor (DHS-001, ABLE, Tokyo, Japan). It was determined that the hydrogen concentration was maintained between 0.55 and 0.65 mM and pH between 7.9 and 8.1 over a 12 to 36 h period. When monitored twice a day at weekly intervals for 4 weeks, it was further documented, that the magnesium stick maintained the hydrogen concentration in the water bottles for the desired length of the study. The concentration of magnesium and calcium in the water were also measured using a standard test method (ASTM D511-09, ASTM International, West Conshohocken, PA, conducted at University of Pittsburgh) and found to be <1.0 mg/L and <1.0 mg/L, respectively. Subjects were provided with 500 ml bottles of drinking water and instructed to place two magnesium sticks in each of five bottles of water at the end of each day in preparation for consumption the following day. Participants were asked to drink 300–400 ml from bottle one, each morning, one hour before breakfast; 300–400 ml from bottle two, one hour before lunch; 300–400 ml from bottle three, two hours after lunch; 300–400 ml from bottle four, one hour before supper; and 300–400 ml from bottle five, one-half hour before bedtime as per instructions provided in the informed consent form. Subjects were instructed to reuse the magnesium sticks by transferring the sticks to a new bottle of water after use. In summary, subjects were expected to consume 300–400 ml of hydrogen rich water 5 times/day for a total minimum consumption of 1500 ml (1.5 L) to a maximum consumption of 2000 ml (2.0 L). The study included 4 clinic visits, which occurred at screening, baseline, week 4 and week 8. At baseline, week 4 and week 8, blood pressure, heart rate, waist circumference and concomitant therapies were assessed, weight measurements were recorded and fasting peripheral blood was collected to determine glucose and lipid profile. Serum chemistry and hematology were repeated at week 4 and week 8 and first morning void urine samples from two consecutive days were pooled for urinalysis at baseline, week 4 and week 8. A treatment diary was dispensed at baseline and week 4 and included forms to record daily product use, changes in concomitant therapies and adverse events and was returned and reviewed at week 4 and week 8. Adverse events were reviewed at week 4 and week 8. Laboratory tests for routine health markers such as complete blood count (CBC), creatinine, aspartate aminotransferase (AST), alanine transaminase (ALT), gamma glutamyl transferase (GGT), bilirubin, total cholesterol, HDL cholesterol, LDL cholesterol, triglycerides and fasting glucose were conducted using standardized procedures at Life Labs Medical Laboratory Services in London, ON. Concentration of 8-hydroxy-2′-deoxyguanosine (8-OHdG) was analyzed by enzyme immunoassay (EIA) (Caymen Chemical, Ann Arbor, MI, Cat. #589320), 8-isoprostane by EIA (Caymen Chemical, Cat. #516351.1), superoxide dismutase (SOD) by enzyme colorimetric assay (Caymen Chemical, Cat. #706002) and thiobarbituric acid reactive substances (TBARS) was analyzed spectrophotometrically using TBARS ASSAY (Caymen Chemical, Cat. #10009055). As this was a pilot study, no formal sample size calculation was performed. Repeated measures analysis of variance (ANOVA) was used to compare pre- and post-treatment measurements of effectiveness and general health markers. Probability values less than 0.05 were considered to be statistically significant. The change from baseline to week 4, and week 8 were compared using Tukey’s multiple comparisons test for 8-OHdG, 8-isoprostane, TBARS, and SOD, total cholesterol, HDL cholesterol, LDL cholesterol, triglycerides and fasting glucose. Adverse events were summarized descriptively using frequencies, and categorizing by intensity and body system. A post hoc sub analysis was also conducted on female and male subjects to determine any differences in response according to gender and on subjects who were current smokers for effectiveness. SAS version 9.1 was used to perform the statistical analysis. All subjects completed treatment with mean compliance of 98.7 ± 3.3 and were included in the analysis. The baseline demographics of subjects are presented in Table 1. Subjects enrolled in the study included those who were pre-hypertensive (n = 3), pre-diabetic (n = 7), and had total cholesterol >5.18 mmol/L (n = 12), LDL-c >2.59 mmol/L (n = 17), BMI 25–34.9 (n = 10), and/or smokers (n = 4). All subjects showed mean normal clinical levels of baseline biometric parameters, clinical chemistry and hematology. * Mean ± SD, **f/n (%) = Number of subjects/Total Number of subjects (percent). BP, indicates blood pressure; BMI, body mass index. The proportion of male smokers was greater (n = 3) than that of the female smokers (n = 1) however all subjects were occasional smokers. The compliance with respect to reporting the number of cigarettes smoked in all the visits was 100%. In two subjects the number of cigarettes smoked remained the same throughout the visits (10 and 20). Oxidative stress is a well-recognized mechanism playing an important role in pathological conditions seen in metabolic syndrome . The effect of hydrogen rich water on markers of oxidative stress is presented in Table 2. TBARS are a marker of lipid peroxidation which is indicative of malondialdehyde formation and lipid damage and is a well-established method for screening and monitoring lipid peroxidation . The concentration of urinary TBARS decreased significantly (p<0.05) from baseline to week 4 and week 8. Subjects demonstrated a significant increase (p<0.05) in SOD from baseline to week 8. Subjects demonstrated increasing trends in 8-isoprostane from baseline to week 4 and week 8. When a post hoc sub analysis by gender was conducted, male subjects demonstrated a significant decrease in urinary TBARS from baseline to week 8 and a significant increase (p<0.05) in SOD from baseline to week 8. During oxidative damage to DNA, damaged products are usually eliminated by repair enzymes and detected as nucleoside derivatives. Urinary 8-OHdG is one adduct of this reaction and has been proposed as a sensitive biomarker of oxidative DNA damage and repair . In subjects who were current smokers, there was a trend toward a decrease in urinary 8-OHdG and TBARS levels from baseline to week 4 and week 8. Subjects demonstrated increasing trends in SOD from baseline to week 8 and 8-isoprostane from baseline to week 4 and week 8. Urinary 8-OHdG, 8-isoprostane, TBARS and SOD were higher in subjects who were current smokers (data not shown). Urinary oxidative stress markers and by gender at baseline and after 4 and 8 weeks of treatment with hydrogen rich water. * denotes statistically significant differences (p<0.05), 95% confidence intervals about the mean difference between baseline and week 4 and baseline and week 8 were obtained via Tukey’s multiple comparisons test. ** Change in urinary oxidative stress markers from baseline to week 4. † Change in urinary oxidative stress markers from baseline to week 8 of treatment. 8-OHdG, indicates 8-hydroxy-2′-deoxyguanosine; TBARS, thiobarbituric acid; SOD, superoxide dismutase. Subjects demonstrated a significant increase in HDL-cholesterol from baseline to week 4 and week 8 and a decrease in total cholesterol/HDL ratio from baseline to week 4 (Table 3). Post hoc sub analysis by gender demonstrated that female subjects had a significant increase (p<0.05) in HDL-cholesterol from baseline to week 4, and a significant decrease (p<0.05) in LDL-cholesterol and total cholesterol/HDL-cholesterol ratio from baseline to week 4. There were no changes in HDL cholesterol, cholesterol/HDL ratio and triglycerides from baseline to week 8. Male subjects demonstrated a significant increase in HDL-cholesterol from baseline to week 4 and week 8 and significant decrease in total cholesterol/HDL ratio from baseline to week 4 (p<0.05) (Table 3). Blood lipid profile of all subjects and by gender at baseline and after 4 and 8 weeks of treatment with hydrogen rich water. * denotes statistically significant differences (p<0.05), 95% confidence intervals about the mean difference between baseline and week 4 and baseline and week 8 were obtained via Tukey’s multiple comparisons test. **N = 19, ***N = 9. †Change in lipid profile of subjects from baseline to week 4. ††Change in lipid profile of subjects from baseline to week 8. LDL, indicates low density lipoprotein; HDL, high density lipoprotein. There were no significant differences in blood pressure, heart rate, weight and BMI assessed at any time point (data not shown). Analysis of clinical chemistry parameters demonstrated that ALT and creatinine were significantly decreased (p<0.05) from baseline to week 4 and week 8 in all subjects (Table 4). Further analysis demonstrated that 80% of subjects (9 females and 7 males) had a decrease in ALT from baseline to week 8 and 95% of subjects (10 females and 9 males) had a decrease in creatinine from baseline to week 8. Clinical Chemistry of all subjects and by gender at screening and after 4 and 8 weeks of treatment with hydrogen rich water. * denotes statistically significant differences (p<0.05), 95% confidence intervals about the mean difference between baseline and week 4 and baseline and week 8 were obtained via Tukey’s multiple comparisons test. **Change in clinical chemistry parameters of subjects from baseline to week 4, †Change in clinical chemistry parameters of subjects from baseline to week 8. AST, indicates aspartate aminotransferase; ALT, alanine transaminase; GGT, gamma glutamyl transferase; eGFR, estimated glomerular filtration rate. The decrease in ALT was significant (p<0.05) from baseline to week 4 and week 8 in female subjects but not male subjects. Creatinine was significantly decreased (p<0.05) in both genders from baseline to week 4 and week 8. Significant increases were demonstrated from baseline to week 4 and week 8 for bilirubin in subjects on hydrogen rich water. Eight females and seven males demonstrated an increase in bilirubin from baseline to week 8. This increase was significant in female subjects, but not in male subjects. GGT was significantly increased (p<0.05) from baseline to week 8 with 85% of all subjects demonstrating an increase during this period (8 females and 9 males). Ninety percent of all subjects demonstrated a decrease in AST from baseline to week 8 (9 females and 9 males). This decrease was significant from baseline to weeks 4 and week 8 in female subjects but not in male subjects. The mean values for these parameters were within the normal acceptable reference range for male and female subjects. In subjects who were current smokers, significant increases were demonstrated from baseline to week 8 for bilirubin and this increase was within normal acceptable reference ranges (data not shown). A total of 28 adverse events were experienced by 13 of the 20 subjects (65.0%) enrolled in the study. Overall, 6 adverse events, experienced by 4 subjects (20.0%) were assessed by the investigator as having a possible relationship to the test article. These adverse events included loose stools (3 subjects), increase in frequency of bowel movement (1 subject) heartburn (1 subject), and headache (1 subject). These adverse events having “possible” relationship to the test article were classified as mild in intensity. There were no serious adverse events which occurred during the study. In this study, we demonstrated that drinking hydrogen rich water increased urinary anti-oxidant enzyme SOD, an endogenous defensive system against ROS-induced cellular injury, associated with reduction of oxidative stress markers, in subjects with metabolic syndrome . SOD plays an important role in the antioxidant defense system against superoxide anion (O2−) generated in vivo and is involved in defense against many diseases [20–22]. 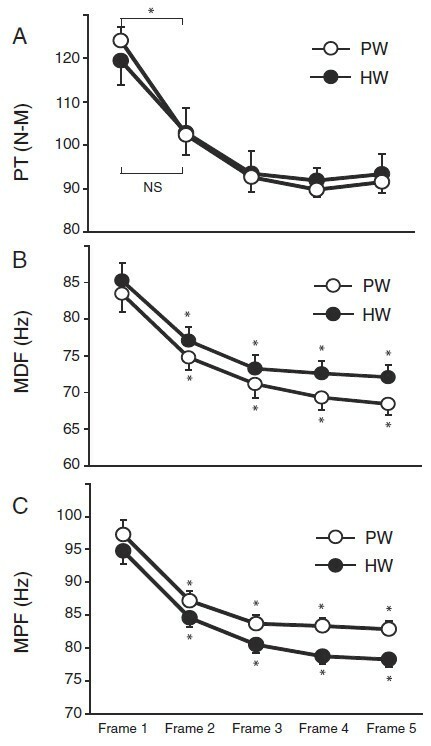 Our data demonstrated that subjects consuming hydrogen rich water for 8 weeks showed significantly increased SOD levels from baseline to week 8, suggesting that hydrogen rich water is capable of inducing SOD activity. Although the detailed mechanisms are undefined an increase in SOD levels correlated with decreasing trends in 8-OHdG levels, and thus supported our hypothesis that oxidative stress is reduced by consuming hydrogen rich water. Oxidative modification of LDL in the arterial wall plays a key role in the pathogenesis of atherosclerosis . A high level of HDL-cholesterol is reported to protect against cardiovascular disease, and low HDL-cholesterol levels (less than 40 mg/dL) increase the risk of heart disease . Results of the current study demonstrated a significant increase in HDL-cholesterol leading to a significant decrease in total cholesterol/HDL ratio by week 4. Decreasing trends were also seen for LDL-cholesterol from baseline to week 4, and triglycerides from baseline to week 8. Though there was an increase in total cholesterol and LDL-cholesterol in subjects consuming hydrogen rich water from baseline until week 8, these values were not clinically significant and were still within a normal acceptable range. The increasing trends may possibly be associated with higher saturated fat consumption, individual food habits and physical activity of subjects. It is possible that the hypolipidemic effect of hydrogen rich water may be due to its ability to prevent lipid peroxidation, as demonstrated by the significant decrease in TBARS, resulting in lower total cholesterol/ HDL ratio, triglycerides and an increase in HDL-cholesterol. Although an improvement of lipid and glucose metabolism after supplementation with hydrogen rich water have been observed in patients with type II diabetes , our results showed that there were no statistical differences in fasting glucose in pre-diabetic participants from baseline to week 8. These results are supported by a previous study where hydrogen water was found to lower the blood glucose level of participants with abnormally high blood glucose levels and did not induce a reduction of a normal blood glucose level . GGT is an enzyme widely distributed in the human body, especially in the kidney and liver . The results of the present study demonstrated that there was a significant increase in GGT (p<0.05) within group from baseline to week 8. However this increase was still within the normal acceptable clinical range for these values for both females and males. Previous studies have showed that there is a positive association between dietary factors and GGT levels . Alcohol and meat consumption are reported to increase GGT levels in a dose dependant manner. However as food records were not maintained in this study we were unable to confirm that the increases in the GGT levels were related to these factors. As the other liver markers such as AST and ALT were not impacted it is possible to suggest that hydrogen water did not have a negative effect on liver function. In this study we found that AST decreased from baseline to week 4 and week 8 in both female and male subjects and these decreases attained significance in the female subjects. The levels of ALT decreased significantly from week 4 to week 8 and in the subgroup analysis this significance was also seen in the female subjects. Taken together it is possible to suggest that the increases in GGT may reflect changes associated with food intake and alcohol consumption of the participants. The values for GGT remained within an acceptable clinical range for this parameter. Interestingly, subjects demonstrated a significant increase in total bilirubin from baseline to week 4 and week 8. These increases remained within normal clinically acceptable range. Serum ALT and AST decreased with hydrogen rich water consumption and the elevation of bilirubin levels seen in this study may be a specific effect afforded by hydrogen. Schwertner et al. previously reported that there was a significant inverse correlation between bilirubin concentration and the prevalence of cardiovascular disease and lower serum bilirubin concentrations were correlated with the presence of ischemic heart disease . Madhavan et al. showed that plasma bilirubin concentration is positively correlated with HDL-cholesterol and confirms the results demonstrated in our study . Thus, the elevations of serum bilirubin levels, below toxic levels, are likely to be protective for cardiovascular disease. The exact mechanisms involved in bilirubin elevation in the subjects treated with hydrogen rich water are not fully understood, however, the antioxidant effects of hydrogen may not be the sole explanation for this increase and other as yet undefined mechanisms may be involved, such as a role in signaling pathways or perhaps other physiological functions. There is a possibility that the higher bilirubin levels are associated with the degradation of heme by heme oxygenase into equimolar quantities of biliverdin (bilirubin) and carbon monoxide (CO), while the central iron is released . The induction of heme oxygenase (HO-1), which is the rate-limiting enzyme, catalyzes the degradation of heme . Further studies are required to determine if hydrogen can induce HO-1. As our hematological data was not altered by hydrogen water consumption and as the elevations in serum bilirubin remained within the normal acceptable range, it is not likely that hemolysis contributed to the increase of serum bilirubin levels. Mean values of all hematological parameters were within normal clinically acceptable ranges. Biometric parameters assessed as a measure of safety remained unchanged during the 8 week period of the study. Results also showed that there were no changes in blood pressure, BMI and weight in subjects after consuming hydrogen rich water for 8 weeks. A sub analysis was conducted on subjects who were smokers as previous documentation has established that smokers are likely to have more oxidative stress  and thus may show a greater benefit from an antioxidant intervention. Subjects who smoked demonstrated a decrease in urinary creatinine, urinary 8-OHdG and TBARS with hydrogen rich water. Further subjects who smoked demonstrated increasing trends in SOD from baseline to week 8 and 8-isoprostane from baseline to week 4 and week 8, and higher urinary 8-OHdG, 8-isoprostane, TBARS and SOD. There was a statistically significant and a clinically important decrease in total cholesterol/HDL ratio from baseline to week 4 and a statistically significant increase in HDL from baseline to week 4. These results demonstrated that oxidative stress was perhaps impacted more significantly in subjects who smoked. In conclusion, consumption of hydrogen rich water generated via a magnesium stick demonstrated improvement in the levels of oxidative stress markers associated with metabolic syndrome and boosted the body’s antioxidant activity. Hydrogen rich water represents a potentially novel therapeutic and preventive strategy for the treatment of metabolic syndrome. This method of delivery was advantageous as magnesium sticks are portable and proved to be an easy and safe administration of hydrogen rich water for daily consumption. We would like to thank the volunteers of this study for their willingness and diligence in complying with the protocol. This study was managed by KGK Synergize Inc. London, ON, Canada, under the supervision of the medical directors, David Crowley, MD and Dale Wilson, MD. Statistical guidance and analysis was provided by Larry Stitt, Assistant Director of the Biostatistical Support Unit, University of Western Ontario, London, ON, Canada. We acknowledge the technical contribution of Joshua Baisley and thank Sonya Barss for overseeing the conduct of the study. This study was supported by Friendear Inc. (Decoupage Minami Aoyama 4F, 5-10-13 Minami Aoyama, Minato-ku, Tokyo 107-0062, Japan). Chronic obstructive pulmonary disease (COPD) is a chronic lung disease with limited treatment options. Hydrogen (H2) has been shown to be anti-oxidative and anti-inflammatory. This study aimed to evaluate the beneficial effects of H2 inhalation on COPD development in mice. A COPD mouse model was established in male C57BL mice by cigarette smoke (CS) exposure. The H2intervention was administered by atomisation inhalation. Lung functions were assessed by using Buxco lung function measurement system. The inflammatory cells were counted and the levels of IL-6 and KC in BALF were assayed with ELISA. The lung tissue was subjected to H&E or PAS or Masson’s trichrome stain. Furthermore, 16HBE cells were used to evaluate the effects of H2 on signaling change caused by hydrogen peroxide (H2O2). H2O2 was used to treat 16HBE cells with or without H2 pretreatment. The IL-6 and IL-8 levels in cell culture medium were measured. The levels of phosphorylated ERK1/2 and nucleic NF-κB in lungs and 16HBE cells were determined. H2 ameliorated CS-induced lung function decline, emphysema, inflammatory cell infiltration, small-airway remodelling, goblet-cell hyperplasia in tracheal epithelium and activated ERK1/2 and NF-κB in mouse lung. In 16HBE airway cells, H2O2 increased IL-6 and IL-8 secretion in conjunction with ERK1/2 and NF-κB activation. These changes were reduced by H2 treatment. These findings demonstrated that H2 inhalation could inhibit CS-induced COPD development in mice, which is associated with reduced ERK1/2 and NF-κB-dependent inflammatory responses. Chronic obstructive pulmonary disease (COPD) is the fourth-leading cause of death in the world (1), imposing a substantial economic and social burden (2). Cigarette smoking is the most common risk factor for COPD. A strong relationship has been identified between continuous tobacco use, oxidative stress, and exacerbation of COPD symptoms (3). Cigarette smokers have a higher prevalence of respiratory symptoms, lung function abnormalities, and COPD mortality rate than non-smokers (4). Currently, COPD drug therapy is used to relieve symptoms, improve athletic ability and health status as well as reduce the frequency and severity of exacerbation. However, there is no known pharmaceutical therapy for COPD that is able to reverse lung function decline (5-8). Therefore, it is necessary to develop new and effective medicine to prevent or treat COPD with fewer side-effects. It has been shown that H2, a physiologically regulatory gas molecule, exerts anti-inflammatory (9), antioxidant (10), anti-apoptotic (11) and signalling-regulating effects (12). Hydrogen gas is able to react with hydroxyl radicals (·OH) directly, which may contribute to its anti-inflammatory and anti-oxidative lesions. Clinical trials have confirmed that H2 can be used to treat cerebral ischaemia, uraemia (13), diabetes (14), metabolic syndrome (15), erythema skin disease, pressure ulcers, malignancies, rheumatism, arthritis (16,17), side-effects associated with tumor radiotherapy and chemotherapy (18), mitochondrial muscle disease, and Parkinson’s disease (19). Furthermore, inhalation of H2 or ingestion of H2-rich water can effectively prevent acute lung injury in mice induced by oxygen poisoning, ventilator injury, ischaemia-reperfusion injury, or sepsis (20,21). H2-rich saline also attenuates cigarette smoke (CS)-induced airway mucus production in rats (22). Xiao et al. reported that H2 saturated water reduced airway remodelling and airway mucus hypersecretion by reducing NF-κB activation in asthmatic mice (23). H2inhalation attenuated lung inflammatory responses in CS-induced COPD in rats. Furthermore, higher concentrations of H2 showed better outcome compared to lower concentrations of H2 (24). These findings strongly indicate that H2 treatment may be beneficial in treating COPD. In the present study, we employed mouse model of COPD with CS exposures, and evaluated the effects of hydrogen gas on the development of COPD. We also examined the effects of hydrogen gas exposure on the activation of ERK1/2 and NF-κB-dependent inflammatory responses induced by hydrogen peroxide (H2O2) in human bronchial epithelial cells. All cell culture reagents were purchased from Gibco (Carlsbad, CA, USA). Masson’s trichrome stain kit (HT15), Cell Counting Kit-8 , and H2O2 solution (7722-84-1) were obtained from Sigma-Aldrich (St Louis, MO, USA). Periodic acid-Schiff (PAS) kit was purchased from Shanghai Sun Biotechnology Co., Ltd (Shanghai, China). β-actin antibody (sc-47778) was obtained from Santa Cruz Biotechnology (Dallas, TX, USA). NF-κB (ab32536) antibody was obtained from Abcam (Cambridge, UK). Antibodies against ERK1/2 (#4695), phosphorylated ERK1/2 (#8544), and histone H3 (#9728) were obtained from Cell Signaling Technology (Beverly, MA, USA). Wild type C57BL/6J male mice (6–8 weeks old) were purchased from the Nanjing BioMedical Research Institute of Nanjing University (Nanjing, China). Animals were housed in the specific pathogen-free facilities and the Animal Care and Use Committee of Guangzhou Medical University approved all experimental protocols. And all methods were performed in accordance with the guidelines and regulations approved by the Animal Care and Use Committee of Guangzhou Medical University. Animals were randomized into the following three groups: control group (CTL, normal air inhalation without CS exposure), CS exposure (CS), CS exposure and H2 inhalation (CS + H2). To establish the COPD mouse model, mice were exposed to CS (9 cigarettes/h, 2 h per exposure, twice per day, 6 days per week) in a whole-body exposure chamber for 90 days, as we previously described (25,26). The cigarettes used in this study were the Plum brand, produced by Guangdong Tobacco Industry Co., Ltd. (Guangzhou, China). Each cigarette yields 11 mg tar, 1.0 mg nicotine, and 13 mg carbon monoxide (CO). For H2 treatment, after exposure to CS for 60 days, mice were treated with H2. H2 and oxygen (O2) were generated by electrolysing deionised water with a H2 apparatus (Shanghai Asclepius Meditech, Shanghai, China). Fresh mixture of H2 (66.7%) and O2 (33.3%) gases was diluted with nitrogen (N2) separated from air to a mixture containing the H2 (42%), O2 (21%) and N2 (37%) and delivered through a rubber tube at a flow of 3.8 L/min to the CS-exposed mice put in a sealed chamber connecting to the outside air through a hole. The H2 inhalation was performed for one hour per session, twice per day with interval of 6 to 8 hours. The mice in control group were put in the sealed chamber and given air. The concentrations of H2, O2 and CO2 in the chamber were monitored at the beginning and by the end of each inhalation to ensure the stability of each air component. The animals were then subjected to lung function assessment before dissection for further analysis on day 91. Lung function was measured using a Forced Pulmonary Maneuver System (Buxco Research Systems, Wilmington, NC, USA) following the manufacturer’s protocol, as we previously described (25). At the end of the chronic CS exposure, hematocrit was measured according to the method as we previously described (25). Every mouse lung was lavaged with 0.6 mL of saline three times. Total cells in BALF were collected and counted using a haemocytometer. The cells were then subjected to giemsa staining for differential counting of neutrophils, macrophages, and lymphocytes under a microscope. After sacrifice, the left lungs of mice were fixed in 10% neutral buffered formalin for 24 h and then dehydrated and embedded in paraffin. The samples were cut into 4-µm sections and stained with H&E for histological examination. Lung sections were stained with PAS to determine goblet cell density or Masson’s trichrome stain for collagen deposition with commercial kits following the manufacturers’ instructions. Alveolar enlargement and destruction were determined by the average linear intercept as previously described (27). Image-Pro Plus version 6.0 software (Media Cybernetics, Rockville, MD, USA) was used to assess the mean linear intercept, reflecting the ratio of total length of alveoli to the number of alveoli per field under light microscopy. Similarly, to quantify collagen deposition in the small airway according to a previously described protocol (28), we used images of all airways with a diameter of 50–499 µm in lungs, including the blue layer outside the airway, which is the layer of deposited collagen, because larger airways are not associated with increased collagen deposition in CS-exposed mice. The area of the collagen layer deposited around small airways was calculated as follows: collagen thickness = collagen area/total bronchial area. Semi-quantitative analyses of the area stained positive area for goblet cells in the airway epithelium were defined using Image-Pro Plus. At least three fields per mouse were used. 16HBE were purchased from the Cell Bank of the Chinese Academy of Science (Shanghai, China) and cultured in DMEM medium containing 10% FBS, 100 U/mL penicillin and 100 µg/mL streptomycin in a humidified incubator at 37 °C with 95% (v/v) air and 5% (v/v) CO2. For treatment with H2O2 plus H2, 16HBE cells were seeded in 6-well plates at 60~70% confluence, then, the cells were serum starved for 12 h, and exposed to H2 (42%) for 1 h prior to 24 h of treatment with H2O2 (0.1 mM) in 2 mL medium containing 1% FBS. After all these treatments, cells were washed twice with PBS, cell lysates were harvested for Western blot analysis. The supernatant was stored at −80 °C for detecting the pro-inflammatory cytokines. The cell viability of 16HBE cells upon H2O2 treatment was determined by using a CCK8 assay kit (Sigma, USA). The cells (5,000 cells/well) were seeded in 96-well plates, which were treated with H2O2 (0–0.8 mM in medium containing 1% FBS) for 24 h. Subsequently, 10 µL of CCK8 solution was added to each well for an additional 2 h. Finally, we recorded the absorbance at 450 nm using a microplate absorbance reader (Thermo Scientific, MA, USA). Cell viability was presented as percentage of cells without H2O2treatment. Nuclear proteins from lung tissues or 16HBE cells were extracted using the NE-PER Nuclear and Cytoplasmic Reagents (Thermo Fisher Scientific) containing a protease inhibitor cocktail according to the manufacturer’s instructions. Histone H3 served as the loading control in Western blotting of nuclear proteins. Mouse lung tissues and cells were homogenized in RIPA lysis buffer containing 1% protease inhibitor cocktail (Sigma-Aldrich), 5 µM EDTA, and 200 µM 4-(2-aminoethyl) benzenesulfonyl fluoride hydrochloride to extract the total protein. Equal amounts of protein in homogenate samples were separated in SDS-PAGE (Bio-Rad Laboratories, Hercules, CA, USA) and blotted with primary antibodies and corresponding peroxidase-conjugated secondary antibodies. The bound antibody signal was developed using an Immun-Star HRP chemiluminescent kit (Bio-Rad Laboratories). Western blot image was obtained by Tanon 5200 Chemiluminescence Imaging System (Shanghai Tanon Science & Technology, Shanghai, China). Semi-quantitative analyses of immunoblots were performed using the Image J. Levels of interleukin (IL)-6,keratinocyte chemoattractant (KC), tumour necrosis factor-α (TNF-α), IL-8, Muc5ac and Muc5b in BALF or in cell culture medium were measured by ELISA. Briefly, human or mouse IL-6 (88-7066/88-7064), mouse TNF-α (88-7324), and human IL-8 (88-8086) were measured using the ELISA kits from eBioscience (San Diego, CA, USA) following the manufacturer’s protocols. KC in BALF was detected with ELISA using capture and detection antibodies obtained from R&D Systems (Minneapolis, MN, USA) according to a protocol described previously (29). Muc5ac and Muc5b in BALF was also detected as described previously (30). The capture antibodies for Muc5ac (sc-21701) and Muc5b (sc-135508) were obtained from Santa Cruz Biotechnology (Santa Cruz, CA), and the corresponding detection antibody was obtained from KPL, Inc. (Gaithersburg, MD, USA). The signal was developed using a TMB Substrate Reagent Set (BD Biosciences, Franklin Lakes, NJ, USA). Data were processed with Graphpad Prism 5 software and presented as mean ± SEM. In the animal experiment, “n” represents animal number, while in the cell experiment, “n” represents the number of experiments repeated. The significance of difference among groups was evaluated by One-way ANOVA and Bonferroni-Holms test. P<0.05 was considered statistically significant. COPD mice were established by CS exposure for 90 days (Figure 1A). Compared with control mice with normal air inhalation, the CS exposed mice presented typical COPD-like lung function decline (Figure 1B,C,D,E,F,G) indicated by increases in FRC, total lung capacity (TLC), Chord compliance (Cchord), FVC, and resistance (RI), as well as a decrease in the FEV50/FVC ratio. Although difference of FVC and RI between CS group and CS+H2 group is not significant, CS-caused increases in FRC, TLC, Cchord and decrease in the FEV50/FVC were attenuated by H2 inhalation. As shown in Figure 1H, CS exposures significantly increased hematocrit value in blood, which was ameliorated by H2 administration. Altogether, these results demonstrate that H2 inhalation ameliorates CS-induced mouse lung function decline and hypoxia-induced hematocrit elevation. H2 inhalation inhibited CS-induced lung function decline in mice. (A) C57BL/6J mice were exposed to CS for 90 days. Mice were then treated with vehicle or 42% H2, and subjected to lung function assessment; (B,C,D,E,F,G) Lung function parameters, functional residual capacity (FRC), total lung capacity (TLC), chord compliance (Cchord), forced vital capacity (FVC), resistance index (RI), and the FEV50/FVC ratio were measured; (H) Hematocrit an indicator of chronic hypoxia, was measured. Data presented as mean ± SEM, n=10 in CTL group, n=8 in CS group, n=8 in CS + H2 group. *, P<0.05; **, P<0.01. Figure 2A showed a typical pathological presentation of COPD, such as damaged alveolar walls and pulmonary bullae, in mouse lungs exposed to CS. Inhalation of H2 significantly reduced structural damage of the lung and accumulation of leukocytes in both the alveolar walls and spaces. Goblet cells from the airway epithelium of CS-exposed mice, identified by PAS staining, contained large granular stores of PAS-positive substances, which was attenuated in the H2 treatment group (Figure 2B). Blue staining displayed severe collagen deposition in the small airway (50–499 µm diameter) in CS-exposed mice, and these effects were reduced by H2inhalation (Figure 2C). These results suggest that H2 inhalation ameliorates CS-induced COPD pathological changes in mouse lung. H2 inhalation attenuated CS-induced emphysema, collagen deposition in the small airway and goblet cell hypertrophy and hyperplasia of airway epithelium. Comparison of H&E or Masson or PAS staining of mouse lung sections from control (CTL), CS and CS plus H2 (CS + H2) treated mice. Software IPP6.0 was used to assess the average linear intercept (Lm) of alveoli (A), goblet cell hyperplasia (B) and small airway remodelling (C) in at least three fields of lung section per mouse. Data presented as mean ± SEM, n=5 in each group. *, P<0.05; **, P<0.01. Figure 3A,B,C,D showed that CS exposure resulted in airway and lung inflammation, indicated by increases in total leukocyte number (i.e., neutrophils, macrophages, and lymphocytes) and higher levels of IL-6, TNF-α, and KC in BALF. H2 treatment attenuated these effects. Levels of Muc5ac and Muc5b were increased significantly in BALF from the CS-exposed group compared to control mice, which was reduced significantly by H2 treatment (Figure 3E,F). These results demonstrate that H2 inhalation attenuates CS-induced airway inflammation and mucus hypersecretion in COPD mice. H2 inhalation reduced CS-induced airway inflammation and mucus hypersecretion in COPD mice. Comparison of total cell count (associated with neutrophils, macrophages, and lymphocytes) (A) and levels of IL-6 (B), TNF-α (C), and KC (D) in BALF from control (CTL), CS and CS plus H2 (CS + H2) treated mice. Comparison of level of Muc5ac (E) and Muc5b (F) in BALF from control (CTL), CS and CS plus H2 (CS + H2) treated mice. Data presented as mean ± SEM, n=10 in CTL group, n=8 in CS group, n=8 in CS + H2 group, *, P<0.05; **, P<0.01. 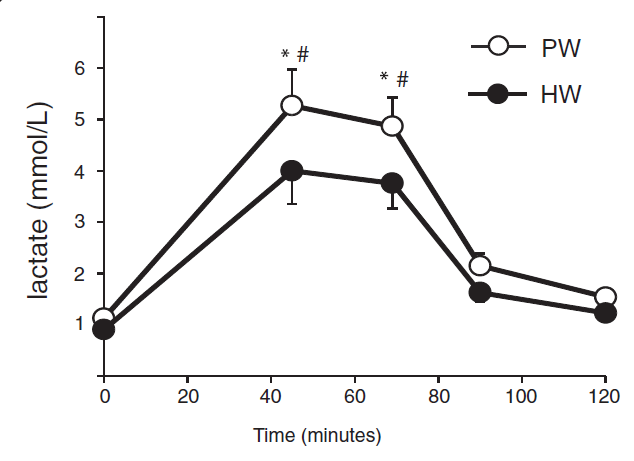 Under the exposure of 42% H2, concentration of H2 in cell culture medium gradually increased with the exposure time, and H2 concentration in cell culture medium was saturated at 60 min (445±36 ppb) (Figure 4A). H2O2, an important factor inducing oxidative stress, is elevated in expired breath condensate of COPD patients compared with control subjects (31), we therefore we investigated the anti-inflammatory and antioxidant abilities of H2 against H2O2-induced oxidative injury in human bronchial epithelial cells (16HBE). After incubating the cells with H2O2 for 24 h at concentrations of 0.1, 0.2, 0.4, and 0.8 mM, we observed a concentration-dependent decrease in cell viability (Figure 4B). While high concentrations of H2O2 (0.2–0.8 mM) decreased cell viability, lower concentration of H2O2 (0.1 mM) did not reduce cell viability, but enhanced the release of IL-6 and IL-8 to culture supernatant (Figure 4C,D). However, lower levels of IL-6 and IL-8 were observed in the supernatant from 16HBE cells pre-treated with H2, compared with levels in the H2O2 group. These findings suggest that H2 treatment prevented H2O2-induced pro-inflammatory cytokine release from 16HBE cells. H2 decreased H2O2-induced pro-inflammatory cytokine release in 16HBE cells. 16HBE cells were treated with H2O2 (0.1 mM) with or without H2 (42%) exposure for 2 h, (A) the H2 concentration in the cell culture medium was measured. 16HBE cells were treated with H2O2 (0.1 mM) with or without H2 (42%) exposure for 24 h; (B) cell viability was measured using the CCK8 assay; (C,D) levels of IL-6 and IL-8 in cell culture medium were measured. Data presented as mean ± SEM, nC=5 in each group, **, P<0.01. Oxidative stress and inflammation play a key role in the pathogenesis of COPD. MAPKs and NF-κB signal pathways play important roles in regulating CS-induced the secretion of pro-inflammatory mediators (32-34), To further elucidate how H2 modulates CS-induced inflammation, we measured the action of ERK1/2 and NF-κB in lung tissue. As shown in Figure 5A, the phosphorylation of ERK1/2 and intranuclear accumulation of NF-κB were remarkably increased in lung tissue from the CS group. H2 treatment significantly reduced these levels. In 16HBE cells, we observed that ERK1/2 phosphorylation and nuclear accumulation of NF-κB were significantly increased when treated with H2O2, while pretreatment with H2attenuated these molecular changes (Figure 5B). Altogether, these results suggest that H2 protects against CS and oxidative stress-induced activation of NF-κB and MAPK signal pathways. H2 inhalation attenuated activation of ERK1/2 and NF-κB in CS-exposed mouse lungs and H2O2 treated 16HBE cells. (A) Levels of phosphorylated ERK1/2 in cytosolic protein fractions and NF-κB/p65 in nuclear protein fractions from lung tissue of mice. Data presented as mean ± SEM, n=4 in each group, **, P<0.01; (B) 16HBE cells were treated with hydrogen peroxide (0.1 mM) for 1 h with or without a 1 h H2 pretreatment. Levels of phosphorylated ERK1/2 in cytosolic protein fractions and NF-κB/p65 in nuclear protein fractions from 16HBE cells were determined. Data presented as mean ± SEM, n=3 in each group, **, P<0.01. COPD is a leading cause of morbidity and mortality worldwide (1,35). The major risk factor for COPD is tobacco smoke, including exposure to second-hand smoke (36). In the present study, we showed that inhalation of high-concentration hydrogen gas ameliorated lung function decline and COPD histopathological changes caused by CS exposure, including pulmonary emphysema, chronic bronchitis, and small airway remodelling. These histopathological changes lead to gas trapping and progressive airflow limitation. The protective role of H2 in CS-exposed mouse lungs is attributable at least in part to its anti-inflammatory and anti-oxidant activities. CS-induced phosphorylation of ERK1/2 and nuclear accumulation of NF-κB in lungs were abolished by H2 treatment. Furthermore, H2 protection against H2O2-induced ERK1/2 and NF-κB-dependent inflammatory responses in 16HBE cells. Based on our findings, H2 is a potential drug for COPD prevention, which could be conveniently delivered by inhalation. In this study, the mouse model was established by CS exposure, a method that mimics the development of human COPD. Inflammation induced by CS is a critical factor in disease development. CS inhalation elicits acute and chronic inflammatory responses, which can potentially cause alveolar destruction. Once lung tissue damage exists and patients has difficulty in breathing. Smoking cessation may not significantly prevent further lung damage (37). The mechanisms for this amplified inflammation are not yet fully understood. Oxidative stress in the lung is likely to further trigger inflammation in COPD (37-39). Even with the present anti-inflammatory medications, we find it difficult to control airway inflammation Unlike the long-acting bronchodilators, it is not easy to find safe and effective anti-inflammatory treatment of COPD (40). So far, there is no treatments to effectively inhibit chronic inflammation in COPD. Recent several studies have indicated that H2 is a new type of medical treatment gas with anti-oxidant and anti-inflammatory properties by alleviating the secretion of inflammatory cytokines, such as IL-6 and TNF-a and some phosphorylating signal factors (41,42). Adding H2 to haemodialysis solutions ameliorated inflammatory reactions by reducing the levels of MCP-1 and myeloperoxidase in plasma of haemodialysis patients (13), which brings the potential therapeutic effect to prevent lung diseases. Our findings demonstrated that inhalation of 42% H2 ameliorated COPD histopathological changes and improved lung function in CS-induced mouse COPD model. COPD is an inflammatory disease of respiratory system, and oxidative stress plays an important role in the process (39). The beneficial effects of inhaled H2 are undoubtedly due, in part, to its antioxidant property (9). However, information on H2regulation in vivo is limited, and the signalling molecules involved require further investigation. Several studies have shown that NF-κB plays a pivotal role in COPD inflammation (37). Moreover, ERK1/2 has been reported to be involved in CS-induced inflammation by modulating NF-κB DNA binding activity in A549 cells (43). In the present study, we found that 16HBE cells pretreated with H2 before exposure to H2O2 released lower levels of IL-6 and IL-8 and displayed reduced activation ofERK1/2 and NF-κB, suggesting that H2 attenuated H2O2-induced inflammation. In vivo, CS-induced ERK1/2 phosphorylation and NF-κB nuclear translocation were abolished by H2 treatment in mouse lung. Therefore, H2 inhalation attenuates CS-induced oxidative stress, leading to reduced inflammatory responses and subsequent emphysema. Pulmonary function analysis is an important tool in the evaluation of mouse respiratory disease models. However, most commonly used pulmonary function variables of human are not routinely applied in mice. An invasive pulmonary function device (forced maneuvers system from Buxco Research Systems) was used to evaluate the mouse model of CS-induced COPD. CS exposure for 3 months caused airspace enlargement in mice. Similarly, statistically significant increases in FRC, Cchord, FVC, TLC and RI, as well as a decrease in the FEV50/FVC ratio were obtained in CS-exposed mice, which consisted with our previous studies (25,26). Furthermore, the CS-induced lung function decline in mice was attenuated by H2inhalation. From a clinical perspective, FVC is usually reduced in actual cases of CS-induced COPD. So it was remarkable that FVC was increased in CS-exposed mice. The mechanism for this is as follows. First, human lung function is measured during active respiration, however, mouse lung function was measured during forced passive respiration. Second, a statistically significant increase in TLC was obtained in CS-exposed mice when compared with the control group, which is similar in humans. Third, due to the larger lung volume upon maximal inflation in CS-induced mice, forced expiration maneuver resulted in significant increase of FVC, whereas FEV50/FVC (parameter for airflow obstruction) during expiration was significantly reduced. Mucus hypersecretion is one of the most important factors in predicting the morbidity and mortality in COPD (44). In the present study, we demonstrated that H2 inhalation significantly ameliorated CS-induced airway mucus production, which were identified by decreased hyperplasia of airway goblet cells and reduced levels of Muc5ac and Muc5b in BALF. This protective effect of H2 on CS-induced mucus hypersecretion was, at least partially, due to its antioxidant ability (22). Compared with other anti-inflammatory drugs for treating COPD, H2 offers several advantages. First, it is nontoxic and reacts with the hydroxyl radical (·OH) to produce water in the body. Second, H2 can easily penetrate membranes and diffuse into the cytosol and nucleus, making it highly effective in reducing cytotoxic substances (45). Third, there is no influence of H2 on the physiologic properties (24,46). Fourth, H2 treatment is simple and inexpensive. Altogether, inhaled H2 is a promising, easily delivered and straightforward therapeutic option for COPD. In conclusion, high-concentration H2 inhalation abrogated CS-induced pulmonary emphysema, chronic bronchitis, and small airway remodelling in mice, as well as reduced lung function decline. This protective action is attributable to the anti-inflammatory and anti-oxidant actions of H2. The inhibition of the ERK1/2 and NF-κB signalling pathways may be implicated in H2’s anti-inflammatory effects. This study provides a foundation for further investigation of the protective effects of H2 on COPD. Although we have demonstrated the beneficial effects of H2 on COPD in a mouse model, its efficacy in humans should be assessed in clinical trials. Funding: This work was supported by grants from the National Natural Science Foundation of China (81670041, 81520108001, 81220108001, 81170052), the 973 Key Scheme of China (2015CB553406), the National Key R&D Project (2016YFC0903700), Guangdong Province Universities and Colleges Pearl River Scholar Funded Scheme (2014, W Lu), Guangdong Province Universities and Colleges Key Grant for Innovative Research (cxzd1142), Guangzhou Municipal Research Project (201607020030), Guangzhou Department of Education Innovative Team (13C08), and Guangzhou Department of Education Yangcheng Scholarship (12A001S). Ethical Statement: Animals were housed in the specific pathogen-free facilities and the Animal Care and Use Committee of Guangzhou Medical University approved all experimental protocols. And all methods were performed in accordance with the guidelines and regulations approved by the Animal Care and Use Committee of Guangzhou Medical University. The pH Scale and Importance of balancing your body’s pH! has a profound effect on your health. All distilled water we have tested falls between 4.0 and 4.5 pH, which means distilled water averages 1000 times more acid than your blood, which should be 7.365 pH. 100 times more acidic than your blood. so they are literally pure H20. Because of this purity, these waters absorb carbon dioxide out of the air, making them acidic and aggressive at dissolving alkaline substances. These waters are as acidic as drinking coffee! While these other forms of filtration do remove various chemicals and/or minerals from the water, they are harmfully acidic and cause oxidation – aging, as they have a positive ORP, unlike ionized water with its negative ORP and high pH. pH (power of Hydrogen) is a measure of the acidity or alkalinity of a solution. It is measured on a scale of 0 to 14. The lower the pH the more acidic the solution, the higher the pH the more alkaline (or base) the solution. When a solution is neither acid nor alkaline it has a pH of 7 which is neutral. • For a person to remain healthy, the pH of blood must be maintained within a narrow range, 7.35 to 7.45, ideally at 7.365 pH. • Plant growth can be severely affected if soil pH is too high or too low, and the availability of plant nutrients and non-essential elements may be affected. • Pipes and pumping equipment can be corroded in a short time if they carry water that is acidic in nature (i.e. low pH). Internal slightly alkaline pH is the key to balance. The goal of the human body is to reach and maintain a state of equilibrium (a neutral pH). Due to the fact that a majority of the foods and drinks we take in are acidic, our bodies are constantly working to neutralize their environment with alkaline elements. When this balance is compromised many problems can occur. For instance, cancer does not live well in an alkaline environment but flourishes in an acidic environment. What we consume either raises or lowers our body pH. For example a soft drink such as a cola has a pH of 2.7-3.0, which is extremely acidic! A soft drink with a pH of 3.0 is going to have a much higher pH after it has passed through the body; it is going to have close to the same pH as your body, about 7.0. It reached that pH level by stealing precious minerals and fluids from your body! Putting soft drinks and other high acid foods in your body lowers your body’s pH making it more acidic, thus more susceptible to disease. It does not give you disease; rather it helps to create the ideal environment for any disease that may come along to get a foothold, may it be environmental, genetic, diet related or by other means. The vast majority of cancer patients possess a very low body pH, ranging from 6.0-5.0 or lower. Our bodies simply cannot fight disease if the body pH is not properly balanced. Want your own pH food chart and tester? A pH of 5 is 100 times more acidic than pH 7 (10×10) and a pH of 4 is 10,000 (10x10x10) times more acidic than pH of 7. This exponential relationship is the same for the alkaline end of the scale. Soda, with its pH of 3, is 10,000 times more acidic than neutral water. Furthermore, Soda is about 1,000,000 times more acidic than high 9 pH water. You need to drink about 32 glasses of high pH water to neutralize the acidity in one glass of soda. EAT SLOW: Drink your food and chew your liquid! Digestion starts in the mouth! EAT 75% RAW: Raw foods (veggies, fruits, sprouts, nuts & seeds) are the best for you! EXERCISE: Jumping with various exercises on a rebounder is fun and a total workout! DRINK WATER: Ionized Water from a water ionizer is best, at least 64 oz’s day!